Celkon is gearing up to launch Millennium Vogue Q455 a new member to the newly announced Millennium series. It will feature a 4.5 inch qHD display with 540 X 960 pixels resolution. The phone will run on Android 4.4.2 KitKat and has a 1GB RAM along with 16GB ROM that’s the highest in its competition. For camera lovers there’s a 8 megapixel rear camera and a 1.3 megapixel front facing camera. 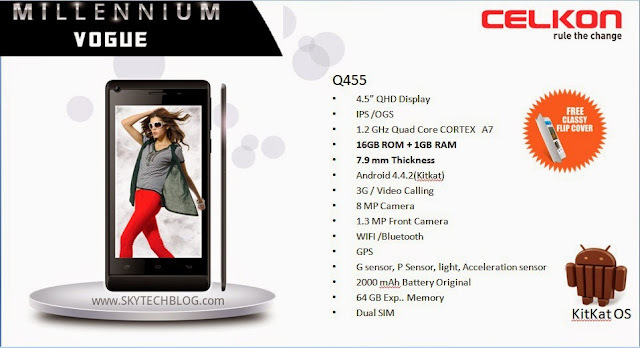 The Celkon Millennium Vogue Q455 will launch on 23rd July. It will also come with a free flip cover There still no word on pricing by the company.